Emily Anicio directs Logan Sweeney as he begins to film a construction update with DACC Public Relations Supervisor Alicia Mowry and Pupil Services Supervisor David Gilliam. This will be the last update filmed by Anicio and her crew before the end of the school year. Emily Anicio sets up equipment with fellow Delaware Area Career Center Digital Design students Micah Bowie, right, and Logan Sweeney, left, before filming Friday at the DACC’s consolidated campus. Since construction on their consolidated campus resumed in November of last year, Digital Design students at the Delaware Area Career Center have been producing regular construction update videos for the benefit of the community. 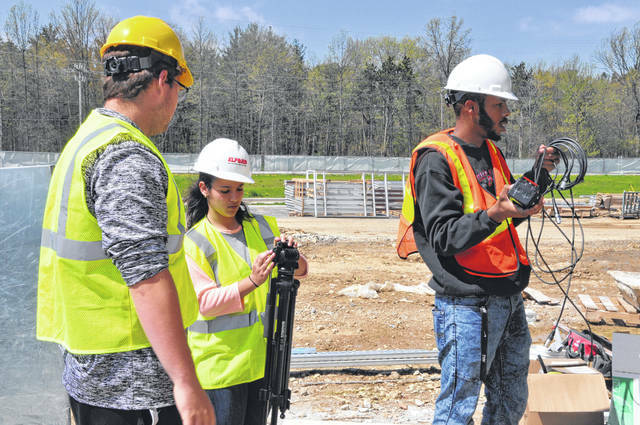 Emily Anicio, a senior from Worthington Kilbourne High School and a senior in the DACC’s Digital Design program, is the director of the construction update videos and oversees the production of the videos from start to finish. Anicio said the first step of the process is getting a potential shooting date from DACC Public Relations Supervisor and host of the construction updates, Alicia Mowry. Anicio said after they pick a date that works with everyone’s schedule, she and two classmates, Logan Sweeney and Micah Bowie, pick out the appropriate equipment including a camera, tripod, dolly or boom microphone, and go over to the construction site to shoot the update. Though the shoots take less than an hour, editing the video down into its final cut takes around six hours of work, spread across two class days, Anicio said. Anicio added she’s learned many things from the project, including not only technical skills like how to use an editor, but also how to be more patient and outgoing. “I’m typically very shy, so this really helped me grow as a person and get better with other people in general,” Anicio said. As director of the project, Anicio oversees Sweeney and Bowie when they are shooting, and she’s grown closer with them during the project and learned to work as a unit. “(Throughout this project) I’ve learned how to be a leader,” said Anicio, who will be attending Capital University this fall. Construction officials told the DACC Board of Education in December that the plan is to complete the new addition at the South Campus first in August 2018 and move the south programs into those facilities while crews renovate the current South Campus. The north programs will move to the consolidated campus in August 2019. Anicio and her crew recorded their final construction update video Friday morning. All of the construction updates can be found on the Delaware Area Career Center’s YouTube page.